Tagged under Akira Amano, Artland, Series. The Reborn! 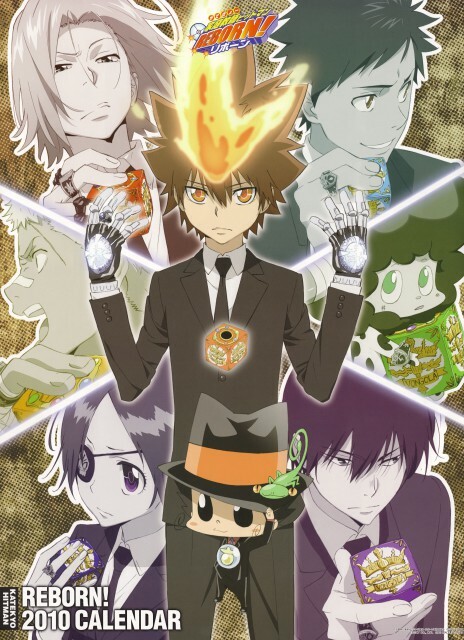 story revolves around a boy named Tsunayoshi "Tsuna" Sawada, who is chosen to become the Vongola Family's boss. Timoteo, a.k.a. "Vongola IX," the current head of the family, sends Reborn, an infant hitman from Italy, to train Tsuna. Tsuna unwillingly undergoes training with Reborn. Tsuna goes through many predicaments as he progresses, including fighting escaped Mafia convicts, a rival group of Vongola assassins and rival mafia families. Through his experiences, Tsuna becomes stronger and more confident. Reborn is a fun, wacky, and overall great anime for any age, despite it's at times ridiculous plot it is a light-hearted and funny anime deep down. If classic shounen anime is your schtick then, you probably don't need much convincing to watch Katekyo Hitman Reborn, but honestly I think that this series can be truly enjoyed by anyone who enjoys anime, which most anime can't do, which is probably what makes Reborn such a hit among it's extremely broad fan base. Despite it's intimidating amount of episodes and chapters, Reborn never gets old and is always funny. I would definitely recommend Reborn to anyone looking for a more light-hearted shounen. 1827 shippers! um.. it's recommended for shounen and comedy genre. the art will be evolved so don't worry about it and keep read/watch it. if you bored and you are KHR fan, just read fanfic. So in other word this anime is AWESOME~!. I went back and re-watched some of this anime and by actually pushing through some of its hammyness I came to find I actually do enjoy this anime. It has its charms and I do like mafia animes much more since Baccano!. I would actually say that this anime does not truly become brilliant until season two begins to air. It really gets much better and starts including much more interesting plots and themes. Its comedy is a bit slap-stick at times that it can just border stupid but overall I had a great time beginning this anime again. This anime is first and foremost a comedy so if you want really great plot and intrigue from the beginning you will have to skip on this anime. A friend got me into this anime. I'm also watching this because it's a lengthy series, I wanted to watch something the would last awhile and not be over so quickly. I have three favorite characters: Giotto, G, and Mukuro. I'd like Tsuna more if he were more serious, and acted how he does when he fights all the time. Lambo annoys me to no end. Reborn makes the show funny. Gokudera acts like a groupie, lol. I hope eventually Yamamoto figures out what they're doing isn't all just a game. I wish Chrome acted like she had a backbone more. Haru is annoying. I like all the box animals except for Lambo's. I also really like Daemon Spade for some reason. I'm currently reading the manga. I like the battles in the anime but at times in both the anime and the manga I feel like they sometimes drag on and talk too much. Aside from liking the art direction and style, can I just say that I learned and realized A LOT from this show. Plus it has one of the best sets of opening and ending themes. My third favorite series now. Alright, this one started brilliantly and then took itself too seriously. At that point it was still alright. Then we introduced 5 other "groups of 7" (too many characters), Pokemon, and ended in an unfortunately abrupt manner. The tone of the story did a total 180 between the first sets of chapters and the last. Even character personalities changed abruptly. Yamamoto, the happy-go-lucky baseball player who always seems cheerful no matter the circumstances nearly committed suicide at the start of the series. Gokudera's smoking habits also disappeared as the plot seemed to dumb itself down. Most "adult" elements were lost by the end of the series, and rather than feeling like a humorous mafia story, it felt like a typical shounen kiddy story. I would have liked Amano to keep some of that original ridiculousness. I do still love the series, despite the lackluster final arc. I just wish it hadn't ended on such a sour note and wish the flow of the story hadn't changed as much as it did. So the beginning of the series was pure humor/character development, which almost made me not want to continue reading-- but due to some character designs (being attractive males) I stuck with it and it turned out to be quite good. Nice to see it come full circle at the end. All the male characters are realy really great... and really awsome, even Tsuna (just sometimes). The plot is odd but very original. That mafia-magic power thing it's simply brilliant! The first ten episodes are boring but when the succession arc begins (when Xanxus breaks in) all get really exciting. And the, as the anime goes on, people get more and more hooked up. As a girl, i cannot choose just one of the boys but the better ones for me are Yamamoto Takeshi, Superbi Squalo, Beelphegor, Xanxus, Fran, Sasegawa Ryohei, Colonelo, Maamon and Reborn. And for girls... well, in this respect we are talking about a very sexist manga: girls juts cook and wash, nothing more nothing less. And when one of them takes the resolve to fight, she's beaten very quickly. There's only one girl strong enough to take action... and it is five years old; I-Pin. The other ones are lame and stupid, very stupid. Most of the scenes are pretty funny. There are diverse characters and that makes this anime more interesting. A clumsy boy should become a Mafia Boss. This sounds like a joke but he actually came that far with many friends by his side. I completely love this series <3 It is enjoyable to watch and the characters are very fun. I watched most of the anime and reading the manga too. The art gets better as the series progresses and I love it! ^^ This manga started off just being funny, but then it became serious and I loved it even more. This has got to be my favorite series. So far so good :) I really love this series so much!! Bishies galore and great storyline as well. I just love how every characters has their own distinct personalities that makes them memorable :) Tsuna and Mukuro <3 nyaaa :3 and Chrome is just cute! All I want to know is, how Akira Amano came up with such a great story!? Who would've thought that a story following the succession of a new Mafia boss is now one of the most loved animes here? I only found the show three years ago and while this review is a little late I'm already finishing my third watching of the show. All of these characters have made an impression in my life and while it's a bit crazy to say I'm glad. I was sad to see the ending of the this amazing show, but I'm still following the manga and I really want her to continue the show! Her storyline always takes the craziest turns, some predictable, others completely mind-blowing. The effects of these shows started out a bit rough, well that's what you expect from starting anime, but either way the studios have come a long way from that and they've put life into the new attack moves and they know what shots keep the suspense up. The filler episodes weren't the best I've seen (mostly just look backs on previous battles) the others were better (like the summer before the Varia came). The music selection for this show is great! It's a first I see character songs and concerts being held for the seiyuus :). I've become a huge fan of this manga and show and I hope Amano Akira keeps up the great work!! I would be really happy if there'll be continuation of it. I heard it would be next year. Not sure whether if it's a rumor though, but I'm still so excited for it! Um...I'm actually commenting about the manga, because in it it can be seen that the author has a huge improvement on drawing detailed fighting scenes such as compare Tsuna VS Xanxus and Tsuna VS Byakuran. The anime kind of reflects on it, although the details are lost in the anime, the music goes with anime quite well, and the characters emotions are captured quite good. If I was to rate the anime around 7 or 8? I got the DVD from a friend, but I haven't got the chance to watch it. I only watched the intro and the Mukuro arc, and read some part of the manga.